Morocco is a land of colourful contrasts – from centuries-old traditions to dramatic landscapes and striking design – the country is a melting pot for creative minds. 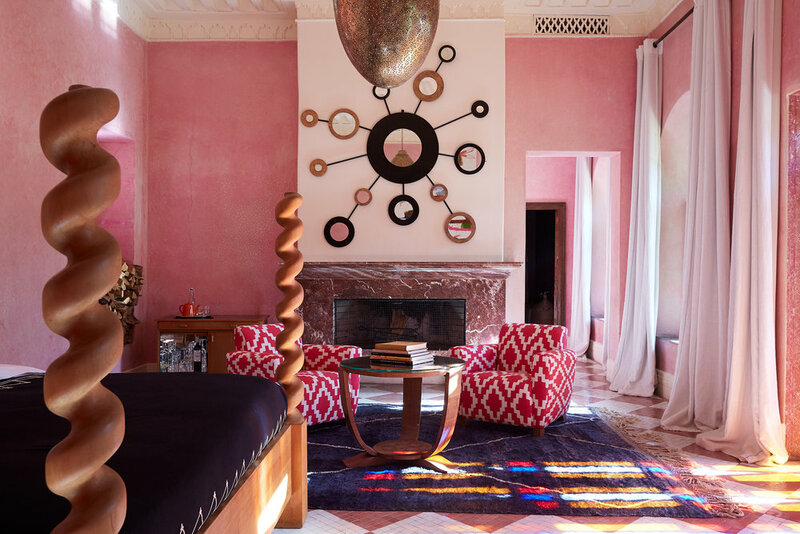 Marrakech in particular has inspired designers for decades. The ‘pink city’ was a huge influence for Yves Saint Laurent who first visited in 1966 and which has since prompted the opening of the new YSL Museum set in the stunning surrounds of Jardin Majorelle. The riads of Marrakech are equally as inspiring, entering a concealed archway you will often discover a hidden oasis from the bustling city beyond. 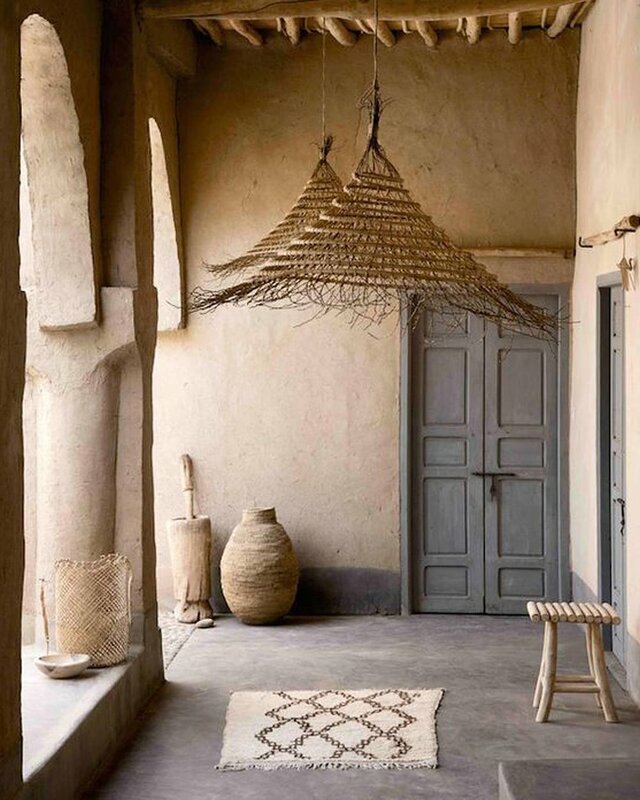 During our recent visit to Morocco, we explored three of the most successful designers showcasing the contrasts of Moroccan traditions through interior design within their own riads. Jasper Conran opened his first hotel project, simply named L’Hôtel, in 2016 in what was once a Caidal palace within the city’s medina. This 19th-century riad now boasts quintessential 1930's charm and combines Moroccan craftsmanship with antique furniture, textiles, lighting and art from the Conran collection. An atmosphere of timeless, relaxed grandeur has been created – white voile curtains flow on the terraces giving privacy to the large suites. Simple whitewashed walls, high zouak ceilings, warm, soft, restful colours and unfussy decoration all create a relaxing feeling of calm and serenity. Romain Michel Meniere has approached his newest project, Berber Lodge, with traditional building techniques. Using minimalism to compliment the lodge’s surrounds where the atmosphere is serene, calm and contrasting to the mayhem of Marrakech’s medina. The country chic interior design works in harmony with the simple but effective furnishings. This lodge bares a stark contrast to Romain’s previous projects – Riad Tarabel and Riad Mena. Dutch designer Willem Smit has also contributed to designing a modern Morocco with the success of Vanessa Branson's El Fenn. Starting his career in theatre in Holland, Willem moved to Morocco to take on the role of General Manager at El Fenn, implementing a complete refurbishment from 2012 to 2014 where he successfully reinvented the much-loved riad with a celebration of art, colour and form. As experts in designing bespoke travel itineraries we can weave any or all of these riads into your journey in Morocco. Get in touch to find out more.